Join us on the Deluxe Motor Coach for a weekend in Islamorada Florida. Islamorada, long recognized as the “Sport Fishing Capital of the World,” is now an icon among sport divers for a similar reason: a massive population of tropical marine life. High profile coral heads and broad ledges shelter huge congregates of French grunt and goatfish, while regal queen angelfish casually graze amid the reef recesses. 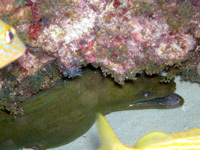 Friendly green moray eels swim freely along the spur-and-groove channels, and reclusive nurse sharks lurk beneath the overhangs. 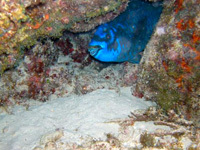 Islamorada offers a wide variety of shallow coral reefs, mini walls, shipwrecks, and even an underwater habitat for scientific research, the Aquarius. * The bus sleeps 12 comfortably, has a large living room, big screen TV, and a DVD player. It also has a classroom located in the back, so we might be teaching specialties on the way down.